Andreas Bjerring from Aarhus-Central Denmark, European Region of Gastronomy awarded 2017 has been announced European Young Chef for 2018 on 26 November. 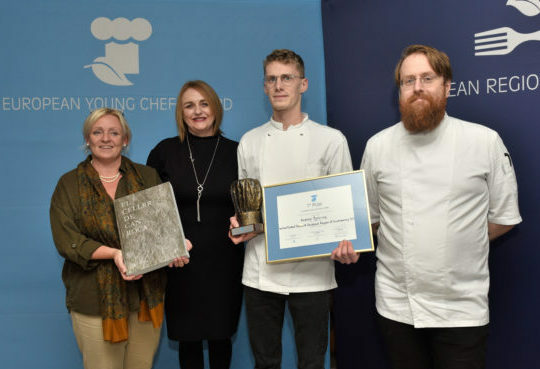 With his dish Memory of my Childhood he won the hearts of the international jury chaired by Michelin-starred Irish chef and Ambassador for Galway-West of Ireland, European Region of Gastronomy 2018, JP McMahon. Andreas innovated the Danish recipe Larded Apples using exclusively local ingredients from Central Denmark Region and transforming a very simple traditional plate by adding a unique explosion of flavours and textures. The jury especially appreciated the extensive level of innovation, the storytelling and the connection of the dish to the region. The surprising taste and crispy texture were also important elements in the decision. JP McMahon congratulated all participants and admitted that the jury had a hard decision to take. He highlighted how all of them have proposed interesting storytelling that came both through their presentations and their cooking. He also stressed how the European Young Chef Award initiative celebrates Europe’s gastronomic diversity. Second prize went to Andra Andruic from Sibiu, European Region of Gastronomy awarded 2019 with the dish Transylvanian Flavours. Antonis Dimovasilis form South Aegean, European Region of Gastronomy awarded 2019 ranked third with the recipe Archegono. Local food cultures are an important source of innovation. Traditions developed over centuries form the vital ‘DNA’ of food cultures and regional gastronomy as well as local knowledge is therefore an important potential source of innovative products and experiences. Sustainable local, regional and global food systems are important for all our futures. The European Young Chef Award therefore aims to stimulate debate about sustainable food and gastronomy practices, production and consumption. Local food products are often unique to the territory from which they come. Likewise, regional culture creates distinctions that underline the added-value of local products. By giving visibility to emerging chefs that support local products, it is hoped to contribute to a more sustainable and better quality of food experiences.